Started training in Shindo Yoshin Ryu Jujitsu at 6 years old. At the age of 30 he studied karate under the instruction of Funakoshi Gichin. In 1939 Hironori founded the Wado Ryu style of karate, this is one of the four main styles taught in the world. 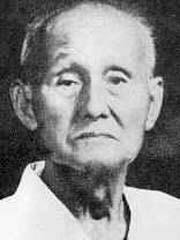 Hironori's son Jiro became the chief instructor of the Wado Ryu system following Hironori's death in 1982.